Wilton-Treat Bags: Tree Heart. Perfect for goody bags, Valentine's treats and more! 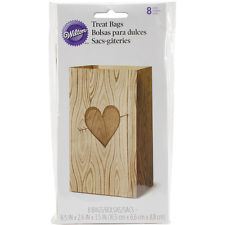 This package contains eight 6-1/2x3-1/2x2-1/2 inch paper bags with a heart on each. Imported.